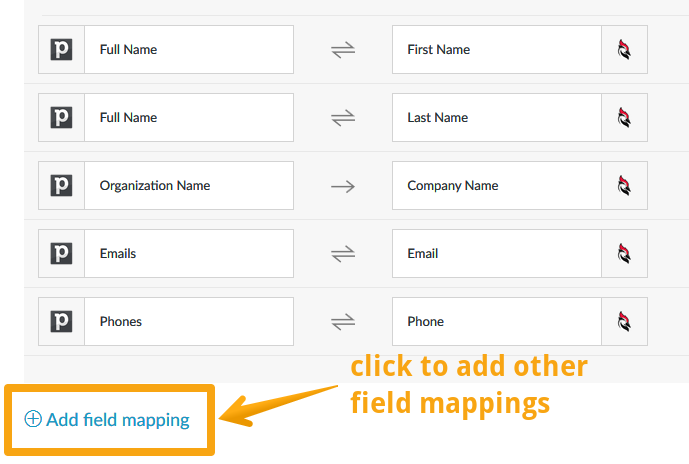 This step-by-step guide will show you how to configure a sync task on PieSync that will be synchronizing your databases between Woodpecker and Pipedrive. Select Woodpecker, and then Pipedrive from the app list in PieSync. To generate a new API Key you need to be a Team PRO or Agency user. Click the API key and copy it to use in PieSync (see below, 2.3.). Click "API" in the second column on the left. Select your API key, and copy it to use in PieSync (see below). To authorize an app, click the authorize button below it, and paste its API key into the dialog box, then click "Next". When that's done, click "Configure the sync between Pipedrive and Woodpecker". For example, add Tag, and type in the tag that should be added (like "New") for the newly synced prospects in Woodpecker. Sync contacts from Pipedrive to Woodpecker, for contacts that have no Deals, and have Active? set to off in Pipedrive. The tag #New will be added to these contacts in Woodpecker. 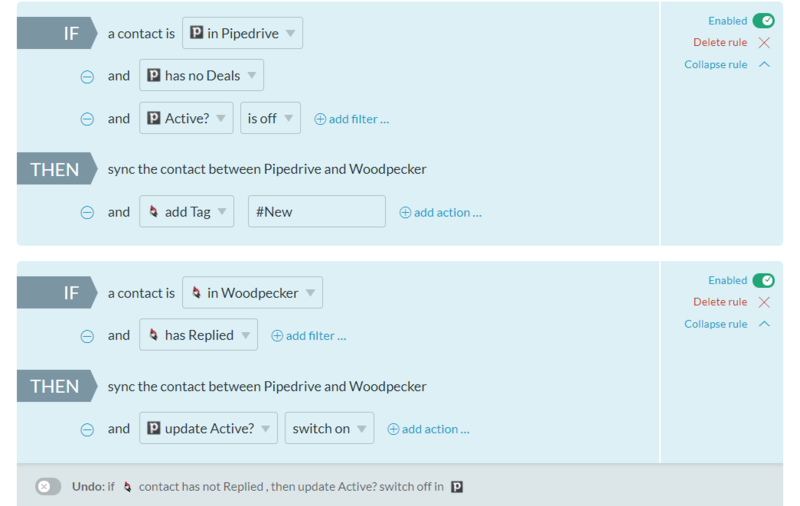 Sync contacts from Woodpecker to Pipedrive, for contacts that have Replied in Woodpecker. The app will also update Active?, switching it to on for these contacts in Pipedrive. A ready-to-use sync between Woodpecker and Pipedrive, with custom filters and actions. For example, if the phone number for a company in Pipedrive is 12345, but it's 13335 for the same company in Woodpecker, one "version" will have to overwrite the other.